The Utilities & Energy Services (UES) Department at Texas A&M University is committed to providing world class service to support the university mission of teaching, research, and service, with a focus on Vision 2020: Creating a Culture of Excellence and Core Values. UES manages a comprehensive Energy Action Plan (EAP) 2020 to ensure continued alignment with the broader University vision and mission. 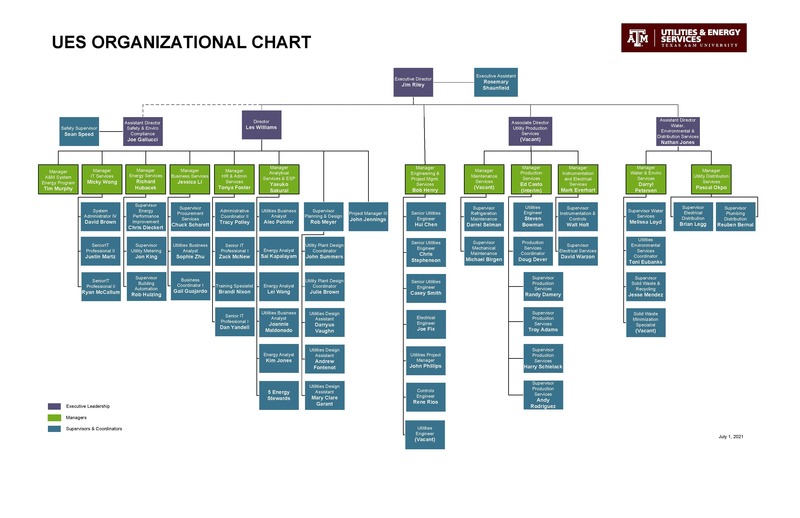 Utilities & Energy Services (UES) is responsible for a wide array of mission-critical services at Texas A&M University in College Station, Texas – providing comprehensive utilities and energy management for over 24 million gross square feet (GSF) of facilities and 20 million GSF of conditioned (cooled and heated) space. An extensive network of electrical distribution and water distribution/collection systems serve over 800 buildings on campus, and provide services across 5,200 acres. Approximately 90 percent of conditioned building space on campus is served by centrally-supplied thermal district cooling and heating systems, supplied from four major utility plants – a Central Utility Plant (CUP) and three satellite utility plants (SUP1, SUP2 and SUP3). UES also manages an extensive network of over 2,000 utility meters used for monitoring, energy management and cost recovery, and operates and maintains one of the world’s largest and most comprehensive building automation systems for HVAC monitoring and control to ensure comfort and effective environmental regulation. The utility infrastructure alone at TAMU has an estimated replacement value of $1.25 billion which includes production, distribution and processing of electricity, chilled water, heating hot water, steam, domestic cold water, domestic hot water, sanitary sewer and storm drainage, solid waste and recycling services. When production and distribution of these services is combined with metering, monitoring, billing, operation and management of building automation systems, together with comprehensive energy services, UES offers a highly reliable and cost-effective range of mission-critical services for close to 70,000 campus customers, consisting of students, faculty, staff, visitors, and contractors. The utility systems at the university have operated continuously longer than any other in the region, with on-site power generation since 1893, together with central thermal energy production and distribution, for cooling and heating, to meet university requirements. A combined heat and power (CHP) plant is operated at the CUP which was upgraded in 2011 to provide the capacity to very efficiently self-generate up to 50 megawatts (MW) of electrical power, serving a campus peak load of 75 MW. On-site power generation serves close to 2/3 of the campus electrical load with the balance of electrical requirements supplied from the ERCOT power grid through the 138,000 Volt University-owned electrical substation served through redundant transmission feeds to campus. This ability to both self-generate and purchase electrical power from the grid provides cost-effectiveness and redundancy, with enhanced flexibility and reliability. Another benefit of CHP is the important capability it provides to meet essential University power requirements in the event of a regional power outage or other emergency requiring isolation from the external transmission system. With the installation of 30,000 tons of high efficiency electric motor-driven chillers since 2002, chilled water production capacity in the four campus utility plants is now at 60,000 tons. The four utility plants on campus produce and deliver enough capacity to cool over 15,000 average homes in Texas. Central heating and domestic hot water to serve campus facilities is generated by 26 boilers and several heat exchangers for distribution to facilities across campus. UES operates and maintains an extensive water production, transmission, storage, and distribution system that supplies all domestic water to campus. The production wells are located several miles north of campus and water is transmitted to campus via redundant supply lines. Storage is provided in several above-ground storage tanks and two elevated tanks – one on the main campus and the other on RELLIS campus. Domestic water storage capacity is sufficient to supply campus for 24 hours in the unlikely event of an emergency interruption of water supply. Emergency interconnections between the University and City of College Station water systems provide additional redundancy for both the City of College Station and Texas A&M University. The domestic water system serving the University is held to the same rigorous testing standards required of all municipal water systems in Texas and is consistently rated as a Superior system by the Texas Commission for Environmental Quality (TCEQ). Sanitary sewer collection systems and two wastewater treatment plants (WWTP’s) are operated and maintained by UES to serve campus. The main WWTP has a capacity of 4 million gallons per day and serves all of main campus, with a smaller collection system and WWTP serving the RELLIS Campus. Solid waste disposal and recycling services for the University are also managed by UES. Solid waste generated by the University averages 1,000 tons per month. Since 2010, the diversion rate for recycled materials (recycled tonnage divided by total solid waste tonnage) has increased to over 65% of the total waste stream, which is a huge improvement from diversion rates that were below 10 percent as recent as 2009. Continued improvements in the recycling program are being made through a Solid Waste Minimization (SWM) Program, including the placement of additional three-stream recycling containers and upgraded Recycling Center drop-off facilities that now serve both the University and the local community. Ongoing efforts continue to raise awareness of the importance of recycling while cost-effectively keeping the recycled material diversion rate as high as practical. Utilities & Energy Services (UES) is managed by the UES Leadership Team, consisting of an executive director, director, associate director, assistant director, eleven managers, and 214 full-time equivalent positions. UES has direct responsibility for the personnel, operation, maintenance, and debt service portions of the utilities and energy budget, of $44 million annually, with annual purchased energy cost of $28 million. UES is also actively involved in the planning and management of energy procurement. A capital renewal budget, or UES infrastructure fund, allows for planned capital renewal and upgrade of the utility infrastructure, which is included in a Utility Cost Recovery Model and updated annually by UES. Energy consumption and cost projections, together with capital and operating expense, are used to update utility rates which are updated and approved annually. Three major categories of customers (Auxiliaries, Agencies, and E&G) are billed directly using metered consumption data and calculated utility commodity rates. UES operates as a service center and as such has no employee salaries directly funded by E&G budget. One significant aspect of this service center status is that all revenue and expenses for salaries, O&M, and debt are passed through a local account, allowing for more transparent accounting. As part of this transparency, UES develops and maintains precise profit/loss statements, and other financial reporting measures to accurately track and report financial status. A utility infrastructure account is used for investment in needed capital renewal, which helps fund essential system upgrades, equipment replacements, and smaller capital improvements. This fund reduces the need to pay for all capital improvements through debt financing and allows for the recovery of actual cost through equipment and system depreciation. While this infrastructure fund does not eliminate the need for debt financing of major utility infrastructure improvements, it reduces the need to incur debt for smaller projects while providing transparency and consistency for cost recovery. For several years, UES has emphasized the importance of service excellence, budget stewardship, and accountability. Each manger is assigned a budget at the beginning of the fiscal year and is held accountable to achieve agreed-upon goals established for each management area. UES management understands well that keeping rates competitive and reducing operating cost while maintaining high reliability and effectively meeting customer and University needs is essential. 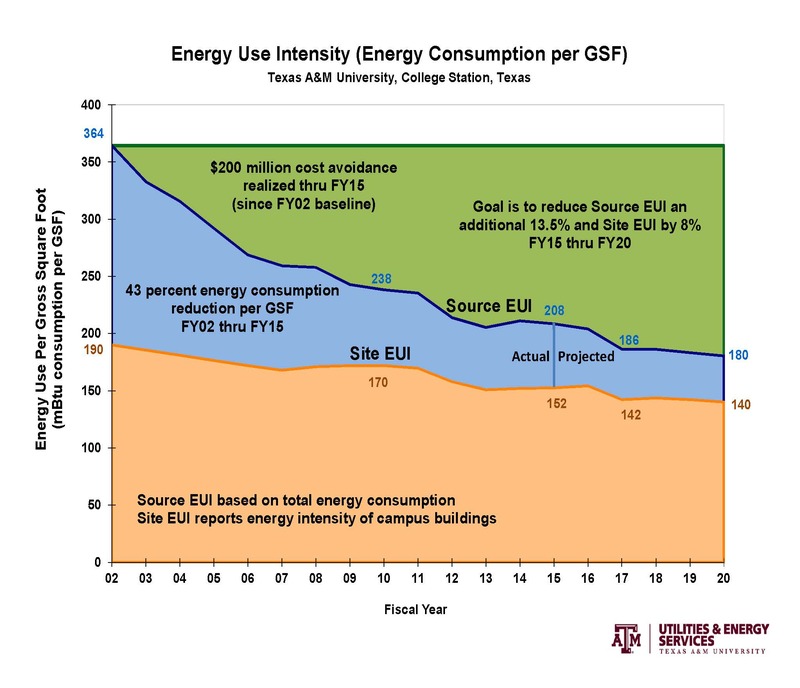 Since 2002, UES has led the effort to achieve over 30 percent reduction in overall energy consumption at Texas A&M University, while the gross square footage served has increased by over 30 percent, resulting in a 45 percent reduction in energy consumption per square foot. A comparable reduction in water consumption on campus has also been achieved over this same period. Energy consumption reduction alone has resulted in over $200 million of cost avoidance for Texas A&M University. This is impressive considering that these efficiency improvements have been achieved together with improved levels of service, safety, and reliability. The current Energy Stewardship Program was begun in FY09 and fully implemented in FY12 with a supervisor and six full-time energy stewards, which helps drive the EAP 2020 Program goals. The energy stewards work full-time with the campus community to support a comprehensive program of outreach, education, and coordination between customers, technical staff, and management. Starting in May 2012, UES initiated an Energy Management Program (EMP) for all TAMU System campuses. The program includes developing an energy consumption and cost baseline for each campus, identifying existing capabilities and opportunities for improvement, identifying new opportunities for energy and cost savings, implementing ‘low hanging’ energy consumption reduction opportunities, identifying and assisting with organizational, operational and efficiency improvements, and establishing and managing ongoing initiatives to ensure responsiveness, proactivity, and continuous improvement. This EMP was fully operational in FY13, with significant results achieved. UES has established and closely manages key performance indicators (KPI’s) to ensure effective standards are established and maintained in all primary areas of responsibility. The UES KPI program measures specific areas of performance and provides feedback to the UES staff and University management. The completion of the combined heat and power (CHP) upgrade in FY12 and other production system upgrades have resulted in $250 million in infrastructure capital upgrades since 2002, which has provided increased capacity, while significantly improving safety, reliability, and operational efficiency. UES pays debt service on these projects through utility rate recovery. In August 2012, Texas A&M University and the A&M System implemented a contract with Compass USA (SSC) to outsource all major functions of the Facilities Services Department, including Building Maintenance, Custodial, and Landscaping Services. Because of the key role that UES performs in the operation of facilities on campus through management of all building automation systems and first response to ensure customer comfort and environmental control, UES and SSC work closely together to ensure quality, cost-effective service to campus customers. This arrangement provides an effective check and balance so essential services can be provided in the most efficient and cost-effective manner. This close working relationship with SSC has developed over time to allow for continuous improvement in the delivery and cost-effectiveness of overall services provided. Managing Financial and Technical Resources – Achieving continuous improvement while managing an increasing number of assets and complex systems will remain a challenge in FY17 and beyond, especially with a growing campus and ongoing budget constraints. UES has developed effective financial measures and reporting to ensure financial resources are optimized. Although providing world class service while upgrading systems, processes, and operating and maintaining an extensive utility and energy infrastructure remains an ongoing challenge, UES manages a highly technical staff that is dedicated, well-trained, experienced, and motivated. The focus financially will remain optimizing the use of the existing operating budget while prioritizing use of the established infrastructure capital fund. Accomplishing this effectively is essential to ensure the utility and energy infrastructure on campus remains highly reliable, safe, and efficient, with proactive planning and investment for the future. A comprehensive Energy Action Plan (EAP) 2020 outlines programs and initiatives in progress and is available on the UES website. An EAP 2020 Advisory Committee has been established and meets regularly to provide feedback and support to achieve objectives.